Week 42: Prologue or No Prologue? If last week’s topic was about Epilogues then this week must be prologues. Indeed, it is, and here we go again. It’s Friday. T.G.I.F. 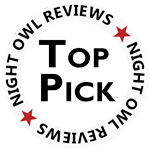 Friday equals Marketing for Romance writers 52-Week Blog Challenge. This should be simple to write. I’ve only written two books with a prologue. After revising one of them some years later, I removed the prologue and revised Chapter One to update the beginning to fit what was happening right now. That book is Howdy, Ma’am so anyone with an original copy has the prologue. In that book, the prologue was a recommendation from my editor. I agreed. It fit the criteria for using a Prologue. What had happened, had taken place earlier than where Chapter One originally had started. When to Use a Prologue Writer’s Digest. Pros and Cons of Prologues from The Editor’s Blog. My time-travel was my first book with a prologue. It makes sense after all since Chapter One started in the present time. The prologue took place in 1882. When I was young, I didn’t read the prologue in books because I didn’t understand why they were there. All I wanted to do was get into the story. Once I understood them, I haven’t skipped one since. Have you ever skipped reading a prologue? I’m the boss here. If I have to tie him to his ranch signpost to make him sweat a little, I damn well will. However, it won’t be easy at four in the morning when he comes out to play in my head. I like to write hero focused romance, which means I can agree about beginning in his POV, but it will be in chapter one, not a prologue. Nope, not for this upcoming book. To wrap it up: I don’t use prologues now and don’t know if I ever will again. I do read prologues and don’t mind when they begin stories. What’s your take on Prologues? 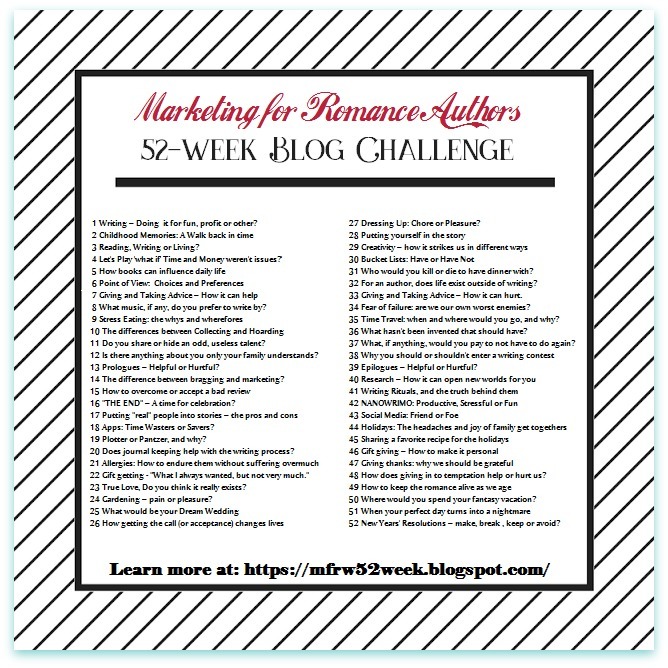 Visit my fellow author participants for Week 42 and Marketing for Romance Writers 52-Week Blog Challenge. If interested in my take on “Epilogues,” click HERE. Ciao! This is week 24 in the #MFRWauthor 52 Week Blog Challenge Blog Hop. Welcome to another week. Wow, this is a scary topic. I’m not sure I like it, either. For one thing, I don’t have what I’d call a “favorite meal,” so I’ll color outside of the lines a little this week. If I have a choice of eating my last meal, it might mean I’m on death row or on my death bed. How depressing. Am I looking at this all wrong? On the flip side, maybe it means nothing more than I’d wake up one day and decide to eat my favorite meal because I could, but I’d pretend it was my last meal, so I’d choose something I’d like to eat. Hmm. If I’m going to eat one last meal, I’m doing it up right. For this last meal, I picture myself in Italy. I love Italian food, so my last meal would begin with the real thing. First stop would be a winery in Tuscany to sample a glass of Chianti Classico. At this winery, we’d share the food you see in this video. Of course, they’d gift me a bottle to accompany me on my journey. “Mmm, delizioso, I say,” licking my lips. “Grazie.” How kind, right? Better yet, since I’m in my own dream here, I’d love to have dinner with, Velia Armano, my heroine in the Bull Rider Series, and her family. In three books, I’ve written enough family meals with the Armano/ McCutchen family, that I feel like I know them, and we’d all be comfortable with one another. We’d have fun together. Her Mamma Lidia can cook for me any time, but for fun we’ll invite my hero, Caulder, and his family, too. If I’m eating my last meal, I want some eye candy sitting across from me. Dolly McCutchen will of course bring her own delicious fare to the meal. Nothing is too good for her son, the professional bull rider. I know, I know. Mix a bull rider with a classy Italian? Yep! La vita è bella! Oh, that was so much fun. Now, to jump back into reality. If I could, or had to eat my last meal, I’d probably eat a roast beef dinner with carrots and potatoes all roasted together. Then we’d have apple pie with vanilla ice cream for dessert. With it would come memories of my growing up years with my grandma, parents, aunts and uncles, and brothers. I’d also have memories of Sunday dinners with my ex-husband and boys—my own family. In the end, the food would be a meal that left me with lasting memories with people I love. Cover: Jimmy Thomas & Iona. Designed by DusktilDawn Designs. Background: Dreamstime.